Have you noticed that mission workers are often expected to be spiritually self-sufficient, able to sustain themselves by feeding on God’s word alone, with little or no access to relevant church or fellowship groups? Curiously, the people who assert this are often those who tell Christians that they cannot survive spiritually without regularly attending church meetings, Bible studies, home groups…. Why are mission workers expected to be so different? The truth is that most of us are not different. We struggle to maintain our spiritual vitality without friends around us. Our spiritual disciplines can fail under the pressure of demands on us. We can become discouraged when we labour long in the mission field with apparently little result. We dry up inside, and our relationship with God can be little more than going through the motions. 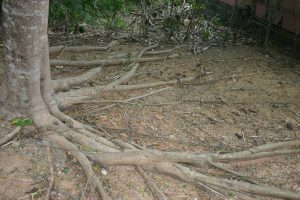 So how can we, as mission workers, put down deep roots into the dry and dusty spiritual soil in which we’re planted? Often there is no easy answer – Psalm 1 might seem like a good place to start but who wants to Bible study night and day? For most of us, it’s simply a case of hanging on and not giving up. And that’s ok. Because trees don’t put down deep roots when the drought comes. That’s the time to pause and wait. Deep roots are not developed during the hard times but in the good ones. When things are easier, perhaps we’re on home assignment, or a retreat, or at a conference, we can experience times of refreshing to see us through the dry periods. This is such an important part of our early spiritual life, our training in church and Bible College, and our pre-departure preparation: building up spiritual stamina through regular Bible study, prayer and worship. These become habits that sustain us through the times of challenge. But what do we do if we’re already in the middle of the drought and we didn’t take the time to develop deep roots before? How do we survive when it feels like we’re all dried up inside? That’s when we need someone to help water us! Make plans for a retreat or a conference. Invite someone to visit who can refresh you. Try a new church or a new version of the Bible that will bring things alive in a new way. Download some sermons or visit a cyberchurch. Hold a skype prayer meeting with friends once a week. If you’ve tried all of these and you’re not getting anywhere, it’s time to re-evaluate your position – are you being effective if you’re that dry? How can you be a witness to the good news if it’s clearly not good news in your life? Many of us are frightened of withdrawing from the mission field in case we’re seen as a failure, but what army doesn’t execute a strategic withdrawal when it realises it’s in an unsustainable position? It is better to leave the mission field than to lose your faith, which is what can happen if we just hang on grimly getting drier and drier without meeting God in the midst of our drought. hmm. Not sure I totally agree with this. I agree you need to fill up before you meet the “dry times”. But a long time in missions can also drain you even if you were filled up properly before you went. yeah, true. But you still also need fellowship. So yes, online contact can help (if there’s internet). I think this is very true, as and extrovert I found it tough initially trying not having places to share and fellowship, but great personal study time became richer and a real lifeline.